Rotating photos in Facebook is a relatively simple process but it is not possible to flip photographs as if they were in a mirror yet. Go to Facebook and make sure that you are logged into your account. 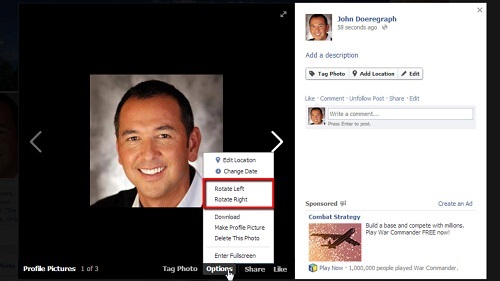 You are going to need to navigate to a photo that you have uploaded – it is obviously not possible to rotate others photographs. 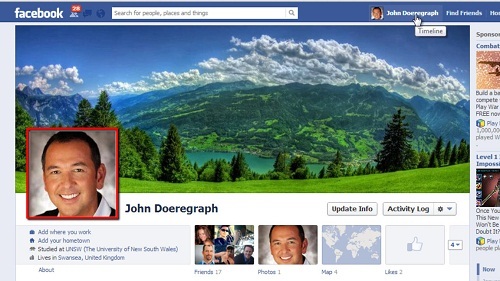 In this example we are going to rotate our profile picture so click your name in the top right corner and then click on the profile picture in the top left part of the profile page. In the window that opens you will see a button at the bottom called “Options”, click this. In the menu that appears there are two rotation options, “Rotate Left” and “Rotate Right”. Click one of these to rotate the photograph. The changes will be saved automatically and to exit the photo window click the close button in the top right. To see the changes to the profile picture refresh the page.